A video game about the Great Famine in Ireland during the 19th century. That’s what Quinnipiac University was looking for when they got in touch with us. Through an approach of brainstorming and offering support where needed, we were able to help the University build the game it sought for, taking two students along for the ride. 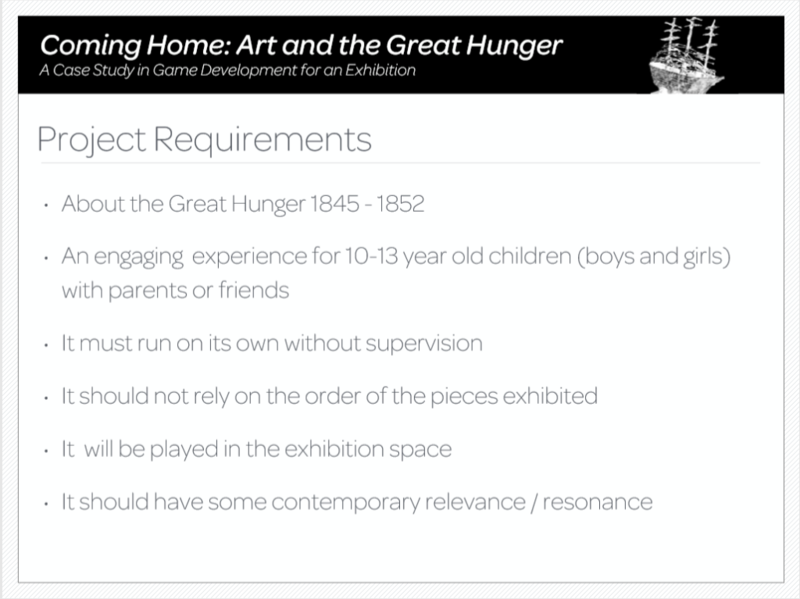 “Make the Great Hunger in 19th century Ireland an understandable topic for children between 10 and 13 years old”, that was the ultimate goal of this project. The final product would be playable in Ireland’s Great Hunger Museum, in Hamden, Connecticut. Quinnipiac University asked us to work alongside two of its brightest students of the BA in Game Design and Development program. Julian Papasian would work on the code, while Katie Rosell provided the art. The Quinnipiac – PreviewLabs team detailing on ‘Timeline Explorer’ – one of the concepts from the brainstorm session. 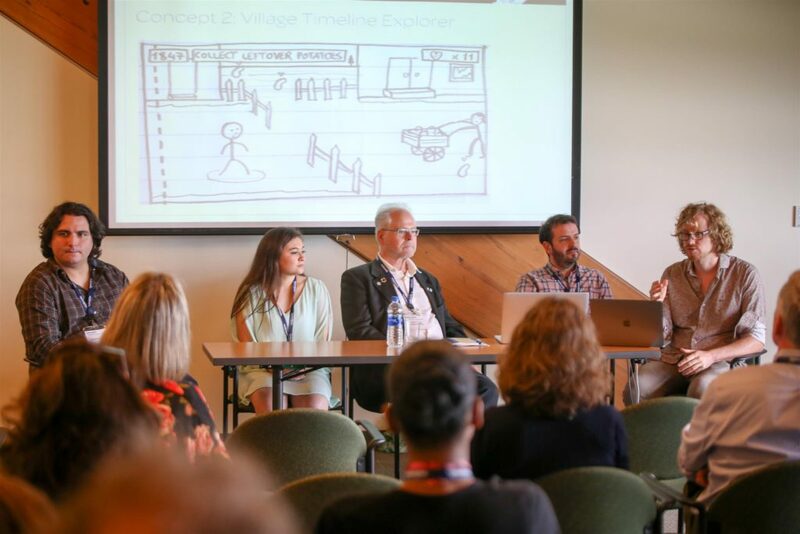 From left to right: Julian Papasian and Katie Rosell (Quinnipiac University Students), Greg Garvey (Quinnipiac University’s Game Design and Development program director and professor), Jonah Warren (assistant professor), and Bernard François (PreviewLabs’ founder). To come up with a number of concepts to choose from, we started off with a brainstorm session. To do this properly, we first defined the requirements for the project in a separate session with Quinnipiac. Within these boundaries we could play around as much as we liked. Before brainstorming, we defined the requirements. Through our joint creative forces we were able to think up some interesting video game concepts. We selected four of those, fleshed out the gameplay mechanics, and came up with different variations and possible additions. These four concepts we captured in a final brainstorm report. Of the four concepts, we all agreed that one specific idea stood out. In the concept – then named Food Distributor – we played with the idea of comparing the 19th century Great Famine with malnourishment today. The player would take up the role of a young woman called Cait during the Great Famine, as well as her present day descendent Liam. The game unfolds in turns, which each represent a full day out of the year. The player gets presented a selection of cards, which hold the food options for each turn. As Cait this could be some spoiled meat, blighted potatoes, and watered down soup. For Liam this might be a slice of pizza, a bowl of cereal, and a granola bar. Each option has its effect on the health of the character, which is influenced by three gauges – one for protein, carbs, and fat. The goal is simple: keep both characters alive. However, actually doing that, isn’t as easy. Have a look at the result here! Cait will struggle with finding decent food and will uncover some other options, true to the history of the Great Famine. She might be able to move to Dublin, and later to the United States of America. If she dies (which is likely in the game, as well as during the famine), Liam will never be born. The turns you play with Cait have a direct effect on the turns you play with her descendant. Also planning on building a game? Have an interesting concept in mind? Get in touch with us. We’ll gladly help you test your ideas through brainstorming and with our signature rapid prototyping approach.